The best accompaniments to a great wine are good company and beautiful scenery. You will find both in abundance on this 13 day Vistas and Vines tour across the South Island. Visit 4 of the south's finest wine regions, the Waipara Valley, Marlborough, Wanaka and Queenstown, while touring through spectacular alpine scenery, driving along coastal highways, visiting glaciers, rainforests and more! Throw in some fine dining experiences along with a range of must-do activities and you have the makings of an unforgettable vacation. You can expect to spend around NZ$165 in fuel cost on this itinerary based on an intermediate sized car. The drive north from Christchurch to Kaikoura takes you through some fine rolling farmland and North Canterbury's major wine region, the Waipara Valley. A great detour to take is to head inland and visit Hanmer Springs for a dip in the natural hot pools. Crossing the Hawkswood Range you descend towards the spectacular Kaikoura coastline and the road hugs the ocean as it winds its way the remaining 15 kilometres to the township. Kaikoura Township is a bustling little place with many cafes, restaurants and shops but the main reason for visiting here is the wildlife. Continuing The road hugs the shore for around 50 kilometres and offers many chances to view the native wildlife such as seabirds and New Zealand fur seals. To the east is the turquoise of the South Pacific Ocean and to the west the towering Kaikoura Ranges. Crossing the dry hills of the Marlborough ranges you head towards one of the most spectacular coastlines of the South Island, the Kaikoura Coast. Blenheim sits right at the heart of the New Zealand's largest wine producing region, Marlborough, and is ideally located to enjoy an afternoon sampling the local produce. A great way to do this is to take a guided wine tour with Sounds Connection Wine Tours. The drive today takes you along the Buller Gorge and offers some wonderful scenery as you follow this magnificent river. The town of Murchison is a quiet place and a great lunch stop. Underneath its sleepy farming facade is an adventurers paradise with white water rafting, kayaking, 4WD trips and some great trout fishing. 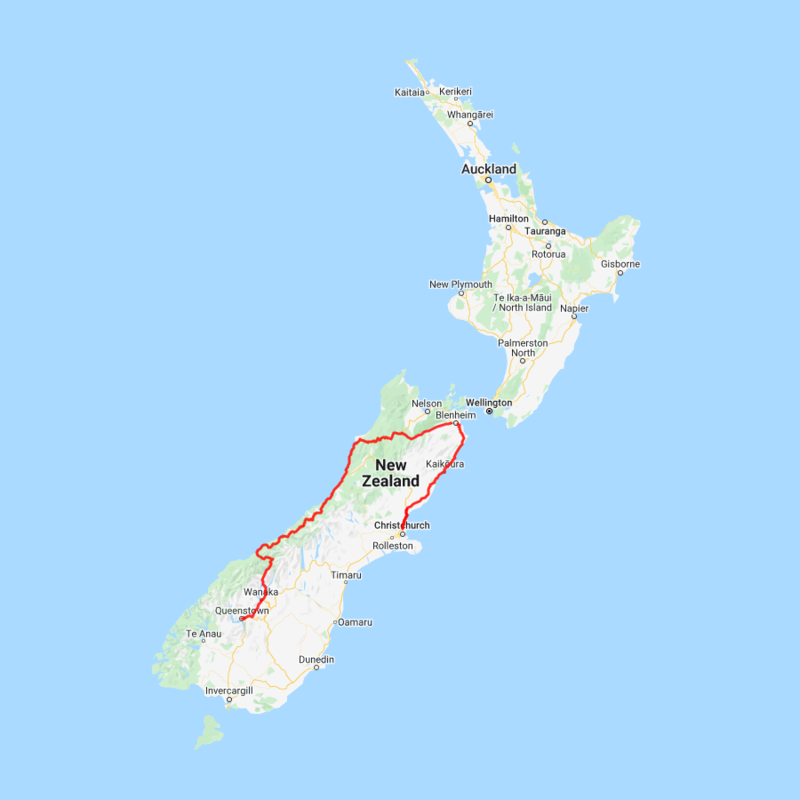 The first major town (by this regions standard) is Inangahua and a small museum tells of the earthquake that hit the region in 1968 leaving 70% of the buildings damaged or inhabitable. Further along the river one of the must stop places is Whites Creek and New Zealand's longest swing bridge. Crossing the river you get magnificent views of the gorge and once on the other side there are short bush walks, jet boat rides and some of the historic gold mining remnants. The port town of Westport is the largest on the Northern West Coast. A history of gold mining, logging, fishing coal mining gives the town a hard working feeling. And to reward the hard workers the town has an extraordinary amount of pubs. There are plenty of activities here such as caving, bush walks and surfing but one of the most popular is to take a trip to Tauranga bay and the seal colony. Just 15 kilometres south at Cape Foulwind (named by Captain Cook for the difficult sailing conditions and not the smell of the seals! ), you will find a breeding colony of New Zealand fur seals. A well marked and easy 10 minute walking track takes you to colony where you can see the creatures lazing around or swimming in the ocean. Continuing along the spectacular West Coast Road towards Punakaiki you are rewarded with dramatic scenery of sheer cliffs, bush clad hillsides, and windswept beaches. Punakaiki is most famous for the Pancake Rocks and Blowholes. Visitors are often less aware of the great many other experiences available. Located in the heart of the Paparoa National Park, the area offers guided beach, forest and mountain walks, canoeing, wildlife, horse trekking, surfing, gemstone hunting, caving and climbing, heritage sites. There are taverns, cafes and restaurants, and a great range of accommodation. The area also boasts a vibrant arts and crafts community and a cooperative gallery. Exploring the famous pancake rocks is best at high tide with the incoming ocean waves sending sea water up the blow holes to create spectacular plumes. There is only one way to experience a glacier, land on it by helicopter and take a guided walk! Fly to Milford Sound through two of New Zealand's most picturesque national parks. View alpine lakes nestled amongst soaring snowcapped mountain peaks and pristine glaciers, with vast rainforest and cascading waterfalls visible from every seat!